MIT’s Computer Science and Artificial Intelligence Laboratory (CSAIL) has created software that can take a look a a video of musicians and isolate the sounds of specific instruments to make them louder or softer. Pretty neat. Right now it appears as if it’s limited to just two different instruments, but I’m looking forward to the time when they will be able to take an audio file and isolate specific players. I want to be able to take a Duke Ellington Orchestra recording, for example, and be able to accurately transcribe the exact voicing that Ellington wrote. One band I perform with regularly will recreate classic traditional jazz recordings and sometimes it’s very difficult to hear specific instruments because of the early recording technology used. Software like this could make it easier to boost the instrument sound that we’re having trouble hearing or turn down the instruments coving up what we’re trying to transcribe. It’s been a while since I’ve been able to post some weekend picks for you. Here are some random music-related sites for you to browse this weekend. Do you like brass band music? Do you like drinking? If you like both, you probably would love Serbias Guča Trumpet Festival. The Dragačevo Sabor Trubaca brings in more than half a million people to a small village in Serbia for a wild weekend of brass bands and drinking. You can read more about it in A Frenzy of Trumpets: Why Brass Musicians Can’t Resist Serbia’s Wildest Festival. If you are studying aural skills or teaching ear training it’s nice to have a repertory of familiar songs to help you recognize intervals. Although some may have changed since this article was posted in 2013, it gives you some practical advice for dealing with flying with your musical instrument. As always, check ahead when traveling with your instrument. Lastly, remember to Be Like Bill. See more of Bill here. A very small part of the population has what is commonly called “perfect pitch.” More properly known as “absolute pitch,” individuals who possess it inherently know what pitch is being played and can sing any give pitch without a point of reference at any time. It offers an advantage to musicians, however our current understanding strongly suggests that this is a skill that needs to be developed before the age of 9 and can’t be learned as an adult. That hasn’t stopped a lot of folks from trying to train adults to acquire perfect pitch. A lot of these are probably scams, although some may be good ways to teach ear training. One common approach is to train your sense of pitch memory so that you always have a point of pitch reference. This is the first significant demonstration that the ability to identify notes by hearing them may well be something that individuals can be trained to do. It’s an ability that is teachable, and it appears to depend on a general cognitive ability of holding sounds in one’s mind. Take a look at the following graph, from Absolute pitch: perception, coding, and controversies, by Daniel J. Leviton and Susan E. Rogers. 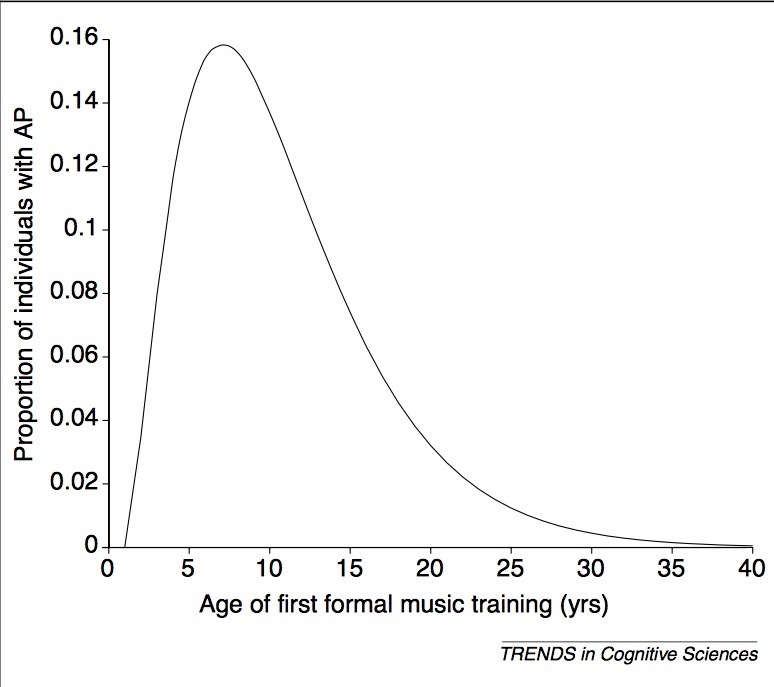 It would also appear that developing true absolute pitch as an adult is extremely rare, in spite of all the courses and effort folks often take in developing it. 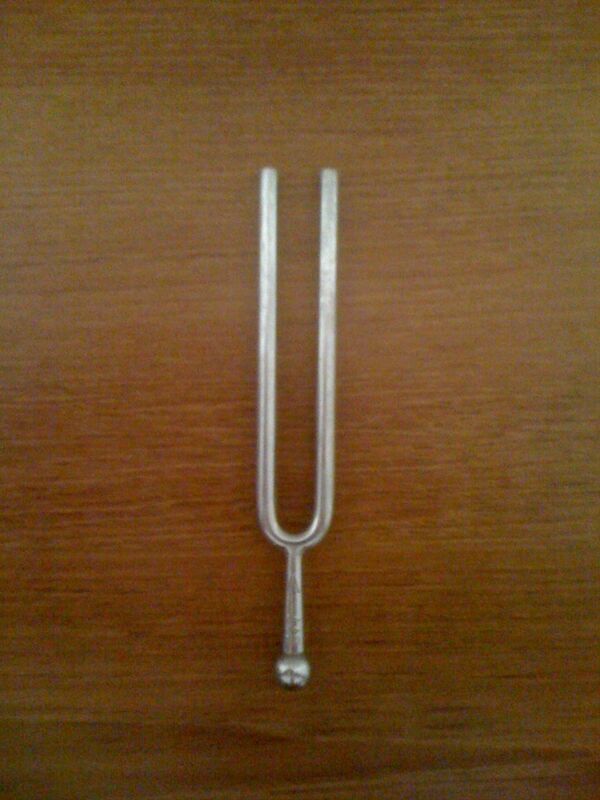 That’s not to say that working on your pitch memory is bad, any ear training is good for your musicianship. I would recommend, however, that you focus your ear training practice on skills that are practical for what you want to do. I would argue that it’s more important to focus your effort on pitch relationships, that is to say, relative pitch. Even folks with perfect pitch have to practice this and spend time on it, and this skill is much more critical than being able to recognize a pitch without a point of reference. Here’s another short online quiz you can take to test whether you are tone deaf. I’ve written about congenital amusia before. The test that I linked to then was much more difficult and designed for scholarly inquiry. Today’s tone deaf test is much easier. It only takes a few minutes. Try it out and let us know how you did. I recently got the chance to teach an introduction to improvising over a blues in F to a couple of classes at North Buncombe Middle School. I put together a handout for the students and wanted to share it here, along with some ideas on how you can use this to introduce improvisation to virtually any group of woodwinds and brass players. It’s basic concept is flexible enough that you can use it to teach age ranges from middle school to adults and adjust the speed and difficulty level accordingly. 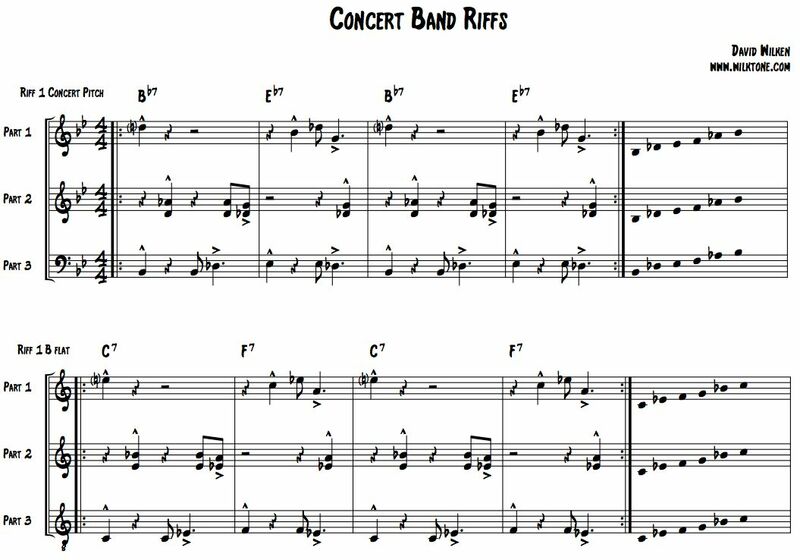 First, download the Blues in F Concert Band Clinic handouts and take a look at the score. The very first thing on each part is the F blues scale. Letter A is one chorus of blues in F with the chord symbols for each part and each chord arpeggio stacked up to the 7th of the chord. But before you even hand out the music to your band, I suggest you try teaching some of this to them by ear. Depending on your students, what they may already know or be able to pick up, and how much time you have to devote to this, you might do only a bit by ear and then refer to the handouts. If you have a lot of time you might be able to do the whole thing by ear. But no matter what level or age group, I think it’s important to approach teaching improvisation as “sound before sight.” The goal is to get the students playing what’s not on the page, so get them used to not using music as quickly as possible. You may want to start teaching by ear by demonstrating one strategy to help beginners match your pitch. Have a student who plays an instrument quite different from the one you’re playing chose a random pitch and hold it out. Whatever pitch he or she played, play a pitch a ways away from it and play a slow chromatic scale, getting slower the closer you get to the pitch, until you end up on the same pitch. I would intentionally do this on an octave or two away, if feasible, to also demonstrate that you can use the same technique if the pitch they’re trying to match is out of their normal playing range. Then with a goal in mind, teaching the blues scale for example, teach your band the pitches one note at a time. When the majority of your band has matched the pitch, cut them off and establish what concert pitch everyone was playing. I usually do this by asking students in different sections, although sometimes you have to introduce transposition if they haven’t learned how to do it yet, so you might skip that step or just ask about what pitch their transposed pitch was. Teaching the basics of the blues form can also be done by ear. In the clinics I gave the other day I taught them the roots of the three chords by ear and then had them repeat riffs back to me. I played only a single pitch (F, Bb, and C) on each riff and just played simple rhythms, but in doing it I went around the blues form. With plenty of time or more advanced students you could teach the chord arpeggios or fragments of chords by ear as well. Here are the riffs at letter B. There are three riffs happening that when put together provide enough of an accompaniment to improvise over. Higher voices, such as high woodwinds and trumpets, have a rhythmic riff that is based on the 3rd and 7th of each chord. 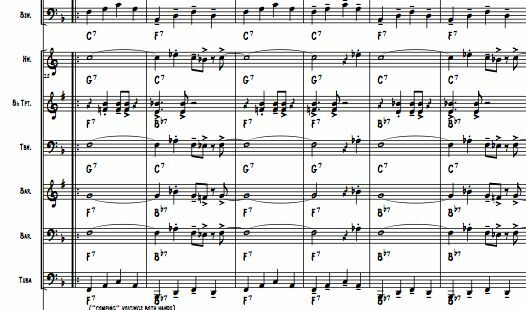 The tenor and alto voices have a 3 note riff with longer notes and the bass voices play the triads of each chord. Because each riff is simple you can teach them to your band by ear and even make everybody learn all three riffs, depending on how much time you can devote. At the very least, it’s useful for everyone to learn to play the bass riff by using the stacked chords at letter A. The other day when I was giving this workshop the balance of the mixed groups I was working with was such that there wasn’t enough of the bass line. I simply had some of the other lower range instruments play the chord arpeggios over the form. If you need more of another riff, you can also easily change sections around as needed. Whether you teach the riffs by ear or from the handout (or make up your own riffs), once the band has gotten it together enough have them play it at a quiet dynamic level while you demonstrate improvising over it. Whatever basic concepts I want to teach with them is how I will play hear. I suggest that you choose a single topic to work on at this point and focus their attention on that. For example, if you’re going to be teaching them to use the blues scale for note choice selections, make yourself demonstrate only using notes in the blues scale. Other topics you could use here include using silence to build interest, playing long notes versus short notes, chord tone soloing, modal improvisation, whatever (if possible, see if you can introduce this topic earlier in your workshop by ear). But play a chorus or two while they accompany you and then you can explain what you did. Then get your band riffing and go down to different players and have them try it out. You can do this a number of different ways, depending on your circumstances and goals. 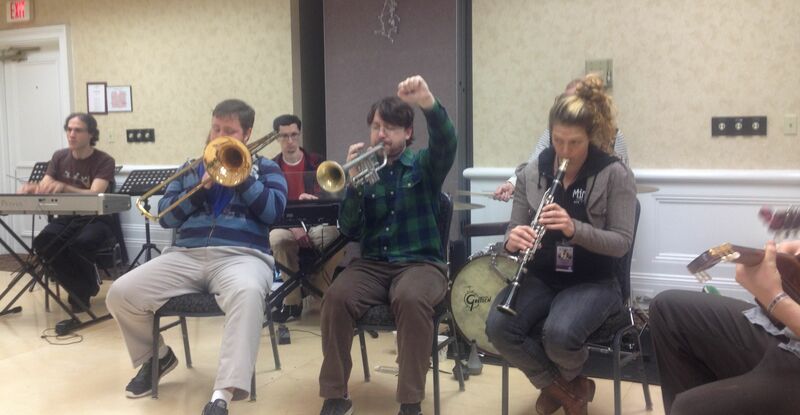 I like to have every student play at least 4 bars and go around the entire band with everyone trading fours. If you have a small enough group and enough time everyone can take a chorus, or you can even just let the braver students jump in and try them out. Regardless of how you organize the students into improvising themselves, I think it’s a good idea to pause a couple of times or so, not only to rest chops and ears, but to evaluate a little bit what was going on. I prefer to emphasize positive things I noticed as well as offer suggestions at this time that other students can try. Demonstrate again for them, if there’s time. The nice thing about using this approach is that it’s flexible. The handouts are designed to help speed things along and give a clinic that goes about 30-45 minutes, but you can jump right in and get them going right away with the handouts. I’ve done similar warmups with student big bands. If you want, you can spend maybe 10 minutes warming up your band on a piece of the handout and the next rehearsal quickly review what you did previously and learn something else new. 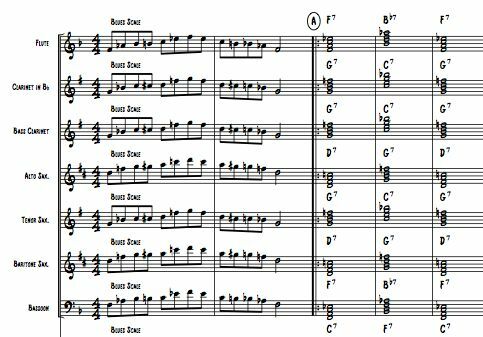 If you’d like to read an earlier post of mine about this topic, as well as download some different riffs you can use with virtually any group of instruments, see Introducing Improvisation in the Concert Band Setting. Please let us know if you are a band director and try this out. How well did it work for you? What did you do differently or what would you change next time around?